"The most widely used strategy guide for buying an Australian business." The Average Australian Business Purchase Involves 36 Critical Questions You Must Ask Every Seller, 200 Individual Points To Investigate, 54 Specific Clauses To Negotiate and 73 Key Issues To Review In Every Business For Sale Listing. According to industry statistics, over 90% of the people who begin the search to buy a business fail to ever complete a purchase. Even worse, the average person looks at business for sale listings for 18 months and still they never buy one! Don't waste your time. There were several common reasons given by those who failed to realize their dream of business ownership: most were first-time buyers and they admitted to having totally underestimated just how much was involved with each stage of the buying process. They felt overwhelmed and ill equipped to handle all of the new situations and major decisions they encountered. Be prepared. Buy a good business and the rewards will be incredible! But don't take anything for granted. You cannot guess your way to success. It takes "know how" to be successful. When you have the right information, it's easy to make good decisions. But without the knowledge, you'll end up buying the wrong business! Before You Buy A Business. 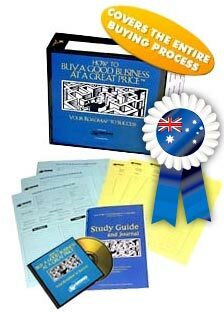 How To Buy A Good Australian Business At A Great Price© is "the most widely used and successful strategy guide for buying a business." This is not a simple, generic introductory book on the subject. It combines critical knowledge and proven techniques for each stage of the process and every situation you'll encounter, along with expert ongoing consulting. This program is specific to the Australian market. It incorporates all of the key information you need to know, the strategies to follow, and the resources to use when buying a business in Australia. If you're serious about buying a business, and especially if you've never bought one before, you've arrived at this website because you want to have the right information and access to unbiased, expert advice to make the right decision. How To Buy A Good Australian Business At A Great Price© is based upon countless business investigations and successful transactions in every field, including manufacturing, retail, a huge array of service-sector companies, the food industry, and wholesale and distribution businesses. The material contains over 500 pages of simple-to- follow strategies, legal agreements, interactive resources, sample letters, case studies, financial spreadsheets, worksheets, and business plan templates. Written by renowned expert Richard Parker, who has personally purchased thirteen businesses and is recognized as "the small business acquisition authority". Buying a business in Australia is not as common as you might think. The popular, but riskier option is to start a business. This flies in the face of logic when you consider that you could buy an existing business with strong cash flows, existing customer and supplier bases, motivated employees, and a presence in the local market. This is why banks are often more prepared to lend for the purchase of a good business. But beware – it can be a complicated and time-consuming process, fraught with difficulty. You need to be prepared. A diagrammatical road map – a clear, concise, step-by-step guide to the Australian business buying process. Evaluating a business - One of the most important steps you will take towards buying a business will be to make a sound judgment on the viability and true worth of what you are buying. In order to properly evaluate a business, you will need access to certain pieces of information. Learn what to ask for and how to analyse the documents you receive. Negotiation - Price is just one aspect of the transaction to be negotiated. Terms are just as important, particularly something as simple as what's included in the sale and what's not! Heads of terms - Also known as 'heads of agreement', this process is where you set out the main terms of the sale. It enables you to describe the agreement in principle, before due diligence and drafting documents has begun. Find out what you should include. Valuation - The worth of a business can be measured objectively, but in the end is determined subjectively – i.e. how much are you prepared to pay? Learn about the various techniques you can deploy to value a business, including asset valuations, Price Earnings (P/E) ratios, discounted cash flow valuations, and other relevant techniques. Due diligence – Here you'll find techniques on how to make sure you're buying what you thought you were buying. Sale & Purchase Agreement - You've satisfied yourself that this business is right for you and that you can finance the purchase. The vendor has accepted your terms. Now the deal needs to be documented in a sale & purchase agreement, based on the Heads of Terms agreed earlier in the process. This is the most important document in the transaction, so make sure you know what should be included. Closing the transaction - After you and the seller have entered into a binding contract, there are usually several conditions to be met before the sale can close. Find out what they are. Post-completion - To maintain a business's momentum it is essential that the transition between owners take place as smoothly as possible. Learn how to do this effectively and efficiently. There are many places where you can find listings of businesses-for-sale, some more reputable than others. This guide tells you where to go to find the best sources of listings. Or find out how to approach sellers directly and discreetly, often a fruitful way of achieving your goal. Searching can often prove time-consuming, so make sure you find out how to save your valuable time! You'll be reading this Australian companion alongside the main course, so here's some guidance as to how buying an Australian business may have its own aspects to consider. There's regulation, tax, law, fees, and property details to consider, plus lots more. How much does the Australian agent charge? What government funding grants are available to me? What's the difference between buying a freehold property or leasehold? In this section you'll also learn about the operational aspects particular to Australian businesses: collecting income tax on behalf of your employees, employment law, and managing your finances are just some of the areas covered. Getting good advice is key. You should aim to assemble the dream team to help you buy the right business. This section tells you how to find and retain good quality advice. How should I use my accountant? Is he up to the job? And when should I involve a lawyer? All these questions and more are answered in this section. How to quickly determine what type of business is absolutely right for you. The key points to identify good businesses or potential problems in business for sale listings. The 36 critical questions you must ask every seller, and the answers to look for. The ten most important factors that every good business must have in place for you to buy it. How to accurately value any type of business so you don't overpay. The specific Australian resources to use to locate good businesses. What avenues to pursue to fund your purchase. How business buying in Australia differs from other countries. Insider guidance to solicit the 'hidden market' of businesses not publicly listed for sale. How to properly 'use' a business broker so you'll see the best listings first. Winning techniques to have the advantage when you negotiate the 50 critical clauses of the deal. Strategies to get any seller to finance the deal. A detailed action plan using our trademarked 200-point due diligence checklist & business investigation guide to uncover all potential problems before you buy. If you're considering a franchise, you'll know where to find a successful resale and what to do to investigate both the franchisee and the master franchiser. How to recognize and avoid all the costly mistakes that most inexperienced buyers make. Most prospective business buyers spend all their time looking at one business for sale listing after another, encountering all kinds of situations and questions they're not prepared for and then they try to determine which, if any, may be right for them. Unfortunately, this is the completely wrong approach! It's also terribly frustrating, time-consuming, and, more often than not, completely unproductive. Step 1: Educate and prepare yourself fully for each stage of the buying process. Step 2: Determine with absolute certainty what type of business is right for you and then focus your search strictly on businesses that make sense. Step 3: Negotiate all of the details to ensure that you put together a deal that makes sense today and down the road. Step 4: Investigate every aspect of the business for sale: the industry, the customers, the financials, the suppliers, the employees and the competition to be sure that you learn everything before you buy! Doesn't this approach make a lot more sense? "What's the use in running, if you're running down the wrong road?" Anybody who wants to learn "killer" techniques to use in every situation and to have the advantage in any negotiation. Before we get into all of the material, there are a few crucial things that we need to share with you about buying a business. Once you own the right business, you will look back at this time in your life and realize that buying a business for sale was the best decision you've ever made. However, from today forward until you buy the right one, there are non-stop, life-altering, and critical decisions that you will have to make. Whether you buy right or wrong is entirely dependent upon your ability to make all the right decisions along the way. Luck and timing have nothing to do with it; knowledge is everything! Just like anything else, when you know exactly what to do in every situation you can't help but make the right decisions each and every time. Buy the right business and you'll experience a change in your life that is so overwhelmingly positive and significant that you cannot even begin to believe how wonderful it is. It's everything and more that you think it will be; truly it is. Buy the wrong business and you are going to subject yourself to such unbelievable mental anguish and financial hardship that it will take years to recover from it, or perhaps you never will. You'll regret the day you ever decided to go into business for yourself. If you're really lucky, you'll barely escape the crushing effect that it will have on you. Suddenly, it doesn't sound so good, does it? There's no middle ground! You will either buy the right one or the wrong one. It's all in your hands. First-time buyers are most at risk of buying the wrong business or overpaying dearly for one. Even worse, they may do both! How can you possibly know what to do if you've never done this before? Don't fool yourself into thinking that all you have to do is look around for a business for sale and then rely on a business broker or the word of the seller to help you make all the right decisions. After nineteen years of helping people buy businesses, we can promise you that it won't happen. There's just no way! If by some chance you have spent any time reviewing the classifieds, searching online businesses for sale, or even contacting business brokers, you should take a step back from whatever you've been doing so far, and carefully consider your next moves in order to do this the right way. How To Buy A Good Australian Business At A Great Price© is a 548 page "how to" strategy guide for prospective business buyers. It's divided into 23 individually tabbed chapters covering every stage of the buying process. It includes interactive worksheets, case studies, real-life examples, and all the critical information needed to help potential buyers become owners of the right businesses. The first part of the program will take you through all of the peculiarities and unique challenges you will encounter in the Australian marketplace. You'll be prepared to handle everything! The second part will outline every step you need to take and what to do at each point to buy the right business. How To Determine The Right Business For You: Knowing what business is right for you is quite possibly the most important aspect of this process. When you match your greatest strengths to the right business you cannot help but be successful. This section includes a complete evaluation of your strengths, weaknesses, likes, dislikes, past successes, failures, previous experiences, interests, and a whole host of other components that will produce a concise list of the types of businesses that are right for you. Focusing Your Search: You'll learn where to look, the specific Australian resources to use, and how to focus your search like a laser beam on businesses that make sense for you. Instead of wasting time searching endless business for sale listings trying to figure out which ones might be right, you'll refine this process to quickly identify prospects that fit your specific criteria. We'll show you how to get immediate replies from brokers and other intermediaries so that you can devote your time to locating the right business instead of chasing people for information. The Ten Commandments - What every good business must possess: This is huge! Our clients rave about this section because you'll learn the ten most important factors that every good business must possess. Presented in a simple format, it is the ultimate test to apply to any business for sale you're considering to quickly determine whether or not it's worth pursuing. After thousands of business purchases, we know precisely what the common ingredients are in every good business! These ten components have proven over and over again to be the foundation of any good business. Using Business Brokers and Intermediaries: Most buyers don't realize that business brokers represent the seller and not the buyer. They're paid a commission by the seller and so their mandate is clear: get you to buy any business for sale, not necessarily the right one. Why use them altogether? They serve two purposes: they can be helpful in providing you with access to businesses for sale and they're the ideal liaisons to deliver any bad news to the seller in order to preserve your relationship, especially if the seller will remain on board after closing to train you. But, it's important that you engage the right one. You'll learn how to check them out and get them to show you listings that are "reserved" for others. Reviewing Business For Sale Listings: There are 73 key issues to look for in every business for sale listing. Hidden things that can tell you a lot about a business, both good and bad. These listings will form the foundation of the many questions you'll need to ask the seller. You'll learn how to review them in great detail so you can immediately identify businesses that are worth pursuing and completely avoid wasting time chasing ones that will never materialize. How To Solicit Businesses That Aren't "Officially" For Sale: We'll also show you how to properly approach and solicit a business that may not be for sale but meets your criteria (by the way, every business is for sale - some owners just don't realize it yet). The right business is out there for you and sometimes you have to go beyond what is "on the market". The key is to approach them effectively so the owners won't take your solicitation to mean that you're prepared to pay any premiums. Thinking About A Franchise? : They're not for everyone; however, the right ones can be a good entry into business ownership, but only for certain people. Don't buy a new franchise; it's only slightly better than a start-up. We'll show you how to buy a resale that's already successful. The Key Questions To Ask Every Seller: There are 36 critical questions that you must ask every seller. You'll learn what they are, when you should ask them, and more importantly, the answers to look for. You will learn how to get the real "hidden" answers, not just what they want you to believe. You'll know the exact things you should and should not say to the seller, what to do, and the strategies to use to have the advantage in every situation and negotiation. Reviewing The Figures (numbers don't lie; sellers do! ): Learn how to verify all of the financials to ensure that they are true and accurate. You'll understand the exact steps to take and the procedures to use to uncover any problems and to see if the seller has "cooked the books" or made certain adjustments to falsify the business. This goes on all the time and the consequences can be enormous! How To Read and Interpret Financial Statements: If you don't know how to effectively read Balance Sheets and Income Statements you'll be at a severe disadvantage. In just one lesson you'll understand how to interpret every type of financial statement like a seasoned pro, and how to immediately identify the inconsistencies. Valuing A Business: Worried about overpaying? Forget it! Use two proven, proprietary methods that will eliminate all of the guesswork and show you how to accurately value any business for sale. These formulas guarantee that you won't overpay for your purchase. We have used these formulas in hundreds of successful purchases. How To Flawlessly Investigate Any Business (this is crucial! ): Every business for sale has secrets that the seller does not want you to discover. You'll know how to uncover everything about any business before you buy! Your investigation must be flawless and it must begin the moment a business is of interest, since there is so much to cover. You'll receive our 200-point Due Diligence Checklist & Strategy Guide that is beyond compare and goes way past the financials to show you precisely how to investigate absolutely every part of the business: the competition, the suppliers, the customers, the contracts, the employees, legal issues, the industry, and on and on. Negotiating The Deal and Making An Offer: Our program will prepare you to effectively negotiate every part of the deal. There are over 50 specific clauses that must be attacked, and this is what separates good deals from bad ones! We provide you with "what to do" checklists and point-counterpoint strategies for each component you'll have to include in a Purchase Agreement. We'll lay out the precise clauses you'll need to ensure you're completely protected from a future decline in the business or purchasing bad inventory or equipment or for any other liabilities that will surely come back to haunt you if you don't protect yourself properly. Financing The Purchase: The goal is simple: get any seller to finance the deal. We won't allow you to put up your house, guarantee the loan with personal assets, or offer your "first born" as collateral. No way! The seller will provide the financing you need. Over 90% of our clients get the seller to finance the bulk of the deal. This is a critically important aspect of the deal. After all, if the seller won't finance you, what does that tell you about the future of the business or his/her belief in you to run it? Post-Purchase Priorities: The first 90 days after you own the business are so important; you'll have a bulletproof plan to operate for the first three months covering every important aspect of the business. You'll have a step-by-step plan of what you must accomplish with the seller during training, how to be certain they are totally cooperative, and how to get them to stay on if necessary or be available to you in the future for any questions you may have. You'll know how to effectively communicate your vision to the employees and how to set your plans in motion to begin to take your good business and make it great. The Australian guide is structured in a way as to make it easy to read, quick to digest, and instantly memorable. - A detailed outline of all of the steps in the process and how to address each particular stage. - The best Websites, trade publications, newspapers, and other resources to find the right Australian business. - All of the unique issues particular to buying a business in Australia. - The resources to use, key contact information, and approaches to fund your purchase. - Specific examples of popular businesses for sale and key data you need to know about each. - A comprehensive section that provides links, phone numbers, and addresses of organisations that can help you with your purchase. - The first steps to take on your road to success. -Personal, financial, and professional considerations you must evaluate. - Key questions and exercises that will help you determine what type of business is right for you. - Avoid wasting time! How to navigate your way through the maze in half the time it takes others. - An examination of all the resources available to use and the best places to find what you're looking for. - A straightforward and concise explanation of all accounting terms. Learn how to tear apart and interpret financial statements in one lesson. - Preparing for the meetings; every single question you must ask and the answers you should look for. - How to get crucial information directly from competitors and industry experts. - Learn a five-step valuation formula that guarantees you will never pay more than a business is worth. - A 200-point checklist that will clearly teach you how to uncover everything before you buy! After you receive your material, (either the CD or download version) simply follow the techniques we've laid out, utilize our consulting service as often as you'd like, and if, for any reason whatsoever, you feel that the information we have provided does not equip you with all of the knowledge and tools you'll need to buy the right business for sale, or if our program does not exceed your expectations in any way, just let us know at anytime and we'll immediately refund all of your money. You can now get the complete course via electronic download and save $40.00 off the CD version price! You'll be on your way minutes from now! Includes all of the interactive resources, worksheets, and Study Guide. With the electronic version, you will receive a link to retrieve your download immediately after you confirm your order. It takes less than five minutes to receive it all. With the CD version, we'll ship everything to you within 48 hours. Immediately after you confirm your order, you'll receive simple instructions to download the complete electronic version so you can get going minutes from now while your program is en route. Study Guide and Journal© - Track your progress, and note key points to remember from each section, and log any questions you'd like to discuss with us. Due Diligence Worksheets© - For the last stage of the business for sale buying process - investigating the company. This is not the time to let anything fall through the cracks! These worksheets will allow you to detail every task that needs to be completed, follow-up to be done, and general notes for this crucial stage of the buying process. A great companion tool for the 50-page section on Due Diligence. Whenever you make any decision in life, large or small, you have to consider both sides of the equation. The cost of this program, compared to what you can expect to pay for and earn from the right business or, how much it can save you from buying the wrong one, is negligible. Is it possible for you to buy the right existing business for sale or franchise at a great price without this training? Perhaps, but why on Earth would you be willing to take that kind of risk? By the way, if you have any questions about our program, if you're not sure whether it's for you, or if I can help you with anything at all on the subject of buying a business, email me directly. It will be my pleasure to assist you.